– Objective: Establish a foundation that can bring about North Korea’s denuclearization and peaceful unification of the two Koreas. – Main points of emphasis: 1) implementing a comprehensive approach to convince North Korea to make the right choices and undertake reform; 2) strengthening the current sanctions regime and improving its effectiveness; 3) seeking opportunities to engage in dialogue with the North that can bring about peace and denuclearization on the Korean Peninsula; 4) increasing cooperation and interactions between the two Koreas; 5) healing the wounds of national division and searching for a humanitarian solution; 6) improving the human rights situation of North Korean citizens; 7) implementing a policy to better incorporate North Korean defectors into the Korean society; 8) securing universal understanding of peaceful unification among Koreans through dialogue between the government and the public; 9) increasing education about unification in preparation for the future; and 10) expanding international cooperation to bring about peaceful unification. On Jan 9, 10 Chinese aircrafts including 6 H-6 bombers capable of carrying nuclear warheads5 entered the Korea Air Defense Identification Zone (KADIZ) near Ieo Island, located south of Jeju. Samsung Electronics Vice Chairman Lee Jae-yong is likely to face charges for bribery, embezzlement, and perjury by the special investigation unit led by Special Prosecutor (SP) Park Young-soo. The SP confirmed that they will charge Lee with bribery of KRW 43 billion. The SP also confirmed that they have sufficient evidence to prove shared interest between Choi and Park. The South Korean court will decide whether to issue the warrant by Jan 18. If Lee is convicted, President Park will be one step closer to impeachment.15 If Lee is also shown to have used corporate funds to support Choi, he may also be indicted for malpractice or embezzlement. According to Gallup Korea, Moon is the clear front runner for the moment. However, there are a number of factors that could alter this projection, one of which is Ban’s party affiliation. 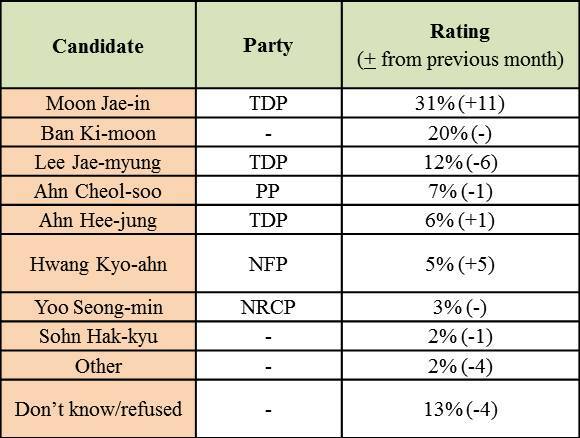 According to a recent public opinion survey, 25.8% of Koreans stated that Ban should not affiliate himself with any of the existing parties while 16% said he should run as a candidate for the NRCP. 10.5% answered that Ban should run under the NFP ticket while 6.3% suggested that he should line up under the PP.33 Another important factor is the possibility of the voting age limit being lowered from 19 to 18. The TDP, NRCP, PP, and the Justice Party have all shown support while the NFP has been hesitant.34 Given the number of high school seniors that participated in the recent candlelight vigils, lowering the age limit could impact the overall turnout and election result. “북한 김정은, 1일 낮 12시 30분 육성 신년사 발표,” 경향신문, 2017년 1월 1일. “국방부 ‘북한, 이동식발사대서 ICBM 쏠 가능성’,” 조선일보, 2017년 1월 10일. “북한 핵탄두 10개 만들 능력 갖춰,” 중앙일보, 2017년 1월 12일. “통일부 ‘북한 비핵화 위한 변화에 집중할 것’…새해 남북 교류경협 어려울 듯,” 중앙일보, 2017년 1월 4일. “방공구역 침범 군용기, 알고보니 핵탑재 가능 ‘중국판 B-52’,” 중앙일보, 2017년 1월 11일. “중국 ‘사드 배치 경고’ 하늘에서 무력시위,” 경향신문, 2017년 1월 10일. “線 넘은 중국… 대한해협 하늘에 韓中日 군용기 50대 뒤엉켰다,” 조선일보, 2017년 1월 11일. “중국 폭격기, 한국방공식별구역 침범…K-15K KF-16 긴급 발진,” 중앙일보, 2017년 1월 9일. “방공구역 침범 군용기, 알고보니 핵탑재 가능 ‘중국판 B-52’,” 중앙일보, 2017년 1월 11일; “중국 군용기 10대 방공구역 침범,” 중앙일보, 2017년 1월 10일. “한민구 국방장관 ‘中 침범, 사드 반발 조치일 수 있다’,” 중앙일보, 2017년 1월 12일. “김관진 ‘중국 상관없이 사드 추진’,” 경향신문, 2017년 1월 11일. “韓日 위안부 합의… 文 ‘새 협상 필요 潘 ‘재협상 가능,” 조선일보, 2017년 1월 9일. “여가부 ‘소녀상 설치와 철거, 정부가 개입하기 어렵다’,” 세계일보, 2017년 1월 13일. “[특검 ‘피의자 이재용’ 소환]이재용 ‘구속’될 경우 박 대통령의 ‘파면 사유’ 명확해져,” 경향신문, 2017년 1월 12일. “특검 ‘최순실에 준 돈 합병 성사 뇌물”… 삼성 “강요에 의한 피해자’,” 동아일보, 2017년 1월 13일. 특검 ‘덴마크 검찰, 다음 주 말까지 정유라 조사 완료’,” 중앙일보, 2017년 1월 13일. “금융위, ‘워크아웃+법정관리’ 新구조조정 방안 추진,” 조선일보, 2017년 1월 5일. “[2017 업무보고]워크아웃·법정관리 장점 결합한 ‘프리패키지드 플랜’ 도입,” 아시아투데이, 2017년 1월 5일. “금융위·법원, 기업구조조정 첫 회의,” 내일신문, 2017년 1월 6일. “당국, 현대건설 감리 착수…건설업 구조조정 촉발하나,” 매일경제, 2017년 1월 6일. “박원순 서울시장 사실상 대선 출마 선언 ‘시대적 요구 따르기로 결심’,” 경향신문, 2017년 1월 2일. “이재명 성남시장, 15일 광주서 대선 출마,” 한겨레, 2017년 1월 6일. “남경필 경지지사 25일 대선후보 출마 선언,” 경향신문, 2017년 1월 11일. “유승민 1월 25일 대선후보 출마 선언,” 경향신문, 2017년 1월 11일. “안희정, 22일 대선출마 공식 선언,” 중앙일보, 2017년 1월 6일. “심상정 대선출마 뜻…18일께 공식선언,” 한겨레, 2017년 1월 9일. “이인제, ‘다음 주 결심 밝히겠대’ 대선 출마 선언…반기문에 경쟁 제안,” 중앙일보, 2017년 1월 11일. 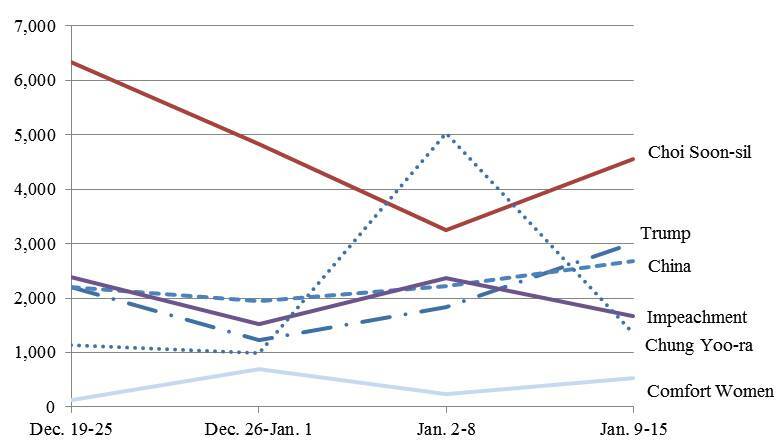 Gallup Korea, date: Jan. 10-12; sample size 1,007; margin of error: +3.1 at the 95% confidence level. ResearchPlus, date: Dec. 28-29, 2016; sample size 1,006; martin of error: +3.1% at the 95% confidence level. “대선 앞 다시 불붙는 ‘18살 투표권’,” 한겨레, 2017년 1월 3일. “‘투표하겠다’ 92%, 대선 열쇠 쥔 20대,” 중앙일보, 2017년 1월 3일. Gallup Korea, date: Jan. 4-5; sample size 1,004; margin of error: +3.1 at the 95% confidence level.